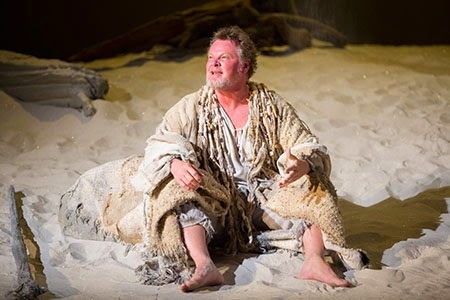 Geraint Wyn Davies as Prospero/Scott Suchman photo, shamelessly pinched from here. Miranda is Prospero's 15-year-old daughter, and since the two of them have been stranded on this island since she was three, she has never seen a human being besides her father. Therefore, the moment that she sees the young hero Ferdinand is a moment of complete wonder and innocence, and the whole meaning of the play stands or falls on the effectiveness of this scene. It is meant to be akin to Adam's discovery of Eve --and himself-- "here at last is bone of my bone and flesh of my flesh." Invariably, however, Miranda's lines are played as double entendres (finally, I get to "do it"). I used to think this was a deliberate effort to inject sexuality where none is, and later decided that no one in the theater today knows what an innocent person would be like, so they are coming by it honestly, not trying to corrupt. So: sigh. I have some other criticisms, but who cares? The production is a delight for the eyes and Geraint Wyn Davies' Prospero is supremely affecting: dignified, human and warm in a way most Prosperos aren't. He's so good it overcomes my mild objections.